Awww, now this is totally adorable Laura!! What a sweet, fun image!! I LOVE that sentiment! So perfect. Love the kitty and your coloring. Oh shoot, I just love this whole card! HOLY COW!!! What a great effect with your coloring! It looks so gosh darned awesome!!! I am in awe!! I will be studying what you did there! Congratulations Winners. Email: christine @ ccdesignsrubberstamps . com (no spaces) with your mailing address so she can send you your Doodle Dragon winnings! We have some extra cuteness joining the C.C. Designs family of Illustrators. Christine was tickled pink when Dustin contacted her... she's always loved his incredibly adorable images, and now they're in Store! To introduce Doodle Dragon we're having a Blog Hop. Three of the Blogs on the Hop are giving away Two Stamps each. But we're not going to tell you who! Leave some love to all the players and on Monday 1st December, we'll announce the Winners. If you get lost, our Hop order is . . . The new stamps are available now and included in the Black Friday Special. What a funny and perfect coloured bunny! Oh I love your fabulous bunny card. 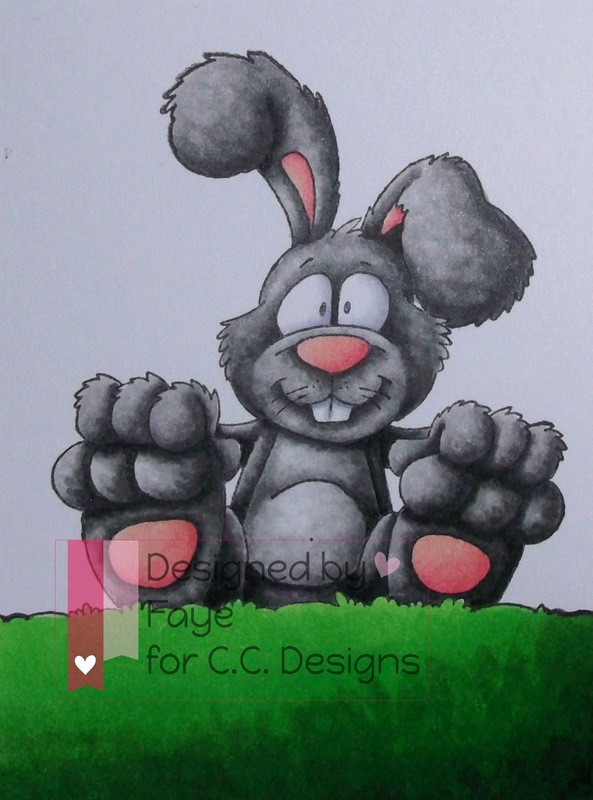 This a super cute bunny and your colouring made him special, as always! Thank you for your lovely comment, you've just seen my first try on the "smootching" tecnique...ehm ehm, correct the word when I'l pubblish it on FB please, I'm not sure to write it correctly! I love everything about your card!!!! So fun! Gorgeous card, Faye and what a wonderful ‘wabbit’! Love his slightly manic expression!! Oh I just love this fun fun wabbit!!! He is gorgeous, love him and your colouring. 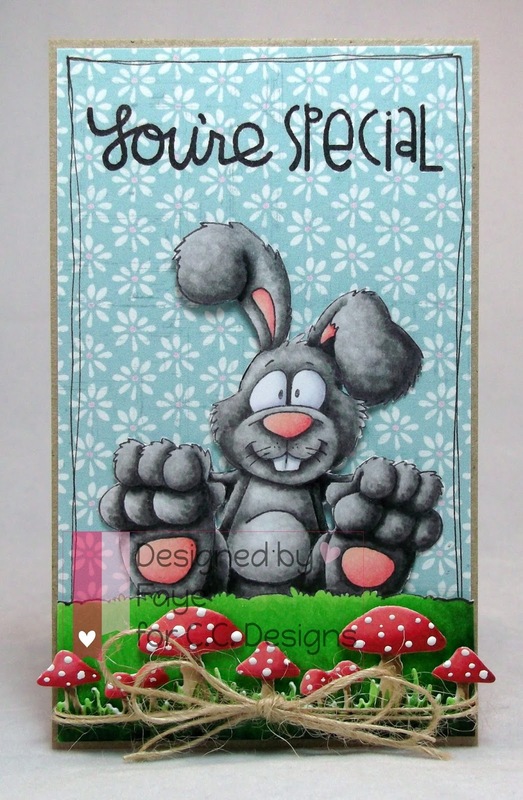 Super cute - love that funny bunny. That bunny is colored so nicely. You can tell he's a lucky rabbit. He has both feet. Great job. Wowzers!! Stunning ... how you colored this cute rabbit!! All that fur .... FAB!!! I like that you gals are sharing the copic color numbers with us! Not that mine would be that awesome but it is good to know what you used to take the guesswork out of that! I love the shrooms too! Great funny bunny! Love your card Faye! Those mushrooms are a great addition to this card. Love this card. So cute Faye!! What a cute, funny bunny! Love it!! I think you may have cottoned on about how much I love this fabulous funny bunny!! Now I just noticed, my toadstool border is not the same as your toadstool border....... hmmmmph!! Love the grouping of image die and patterned paper. He's cute, but that mushroom die is amazing. I love it! Perfect bunny - looks a little devious. Great card, and the mushroom border is perfect with it! I really like the texture on your bunny! Great card. Faye you are another favourite colour artist! Holy blow me away! Love your work! He does make you smile! Way cute! Oh my gosh, I adore this card! Your coloring knocked my socks off!! Spectacular!!!!! Cute bunny! Love how you teamed him up with the mushroom border and decorative sentiment. I also like the tall and skinny card shape, nice touch! Oh boy this has to be my absolute favourite.